One hundred years ago this week, Australia confronted not only the horrors and privations of the Western Front and Palestine but also a strike at home, which saw 100 000 workers around the country walk off the job. ‘Peak Anzac’, the height of the officially driven Anzac centenary commemoration, has passed us by in August 2017; it is a good time to remember some non-military aspects of our history a century ago. The Great Strike, like the conscription battles (covered elsewhere in this ‘Divided sunburnt country’ series), is an important facet of Australia’s Great War, one which deserves to be remembered just as much as Passchendaele and Beersheba. Late Night Live last week did a show on the strike and there is a background article from Stan Correy here. The strike began as a protest against new methods of monitoring workers’ productivity, sometimes called ‘Taylorism’, but fed off and added to other issues at the time, including trade union rivalries, falling real wages, resentment against profiteering, unresolved arguments about conscription, Irish versus English resentments, and war weariness. 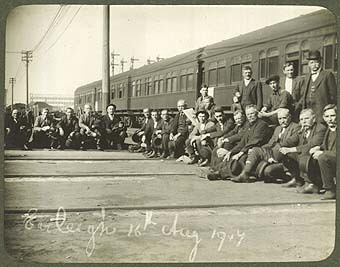 Starting at the Randwick tramway and Eveleigh railway workshops in Sydney on 2 August, the strike spread to other states, particularly Victoria, lasted for a month and ended inconclusively. 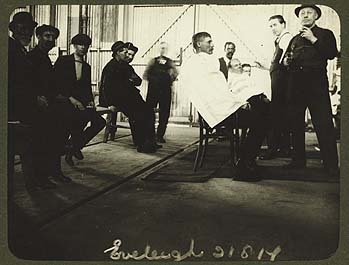 Among individuals affected was Ben Chifley, engine driver, later prime minister, whose involvement in the strike got him demoted, and Joe Cahill, later premier of New South Wales, whose agitation affected his later employment. To mark the centenary, we reproduce below extracts from an editorial in the Sydney Morning Herald, which expresses the fear that the strike will divert Australians from their duty to support the war, and from an editorial and a news item in the Australian Worker, which indicate how closely the union side stuck to industrial arguments. Meanwhile, the Acting Premier of New South Wales, GW Fuller, forcefully put the government’s position. We are now dealing with what is in effect a rebellion against the orderly government of the community. Upon every citizen, whether directly concerned or not, devolves the solemn duty of saying whether he is for the State or for the surrender of all authority to men who for the time being have lost all sense of public duty. Fuller also suggested that the card system grievance was overblown and had been seized upon by agitators. See also this and this on a current exhibition about the strike. The National Library has a curated list of resources. The Goulburn Post has some interesting photographs, including Chifley’s time card. Wikipedia has a useful summary, well-sourced. Among books, there is Robert Bollard, In the Shadow of Gallipoli: the Hidden History of Australia in World War I (2013). ACTU Secretary Sally McManus speaks at the exhibition dinner. As part of a great dominion we are bound in honour to forget all small issues and prove ourselves as worthy champions of the right as those Australians who are fighting against Germany in Europe to-day … It is inconceivable that a strike should develop into civil war – into practical repudiation – in the circumstances; and those who would be parties to anything of the sort must be put where everybody can see and mark them. NOT THE CARD SYSTEM ALONE. True, some of the grievances may be less serious than the one which caused the strike, but they are none the less genuine grievances – and now that the men suffering them have thrown down the gage it is to be hoped that they will be satisfied .with nothing less than the absolute and permanent removal of these wrongs. On the evening preceding the present great struggle, the men opposed to the introduction of Taylorism offered to put their case in the hands of an independent tribunal and abide by its decision – whether in their favor or not. As a set-off against their pledge not to strike, they asked that the Government withdraw the card system till the decision of the tribunal was made known. The Government refused to do so, with the result that the present calamitous strike occurred. It would not have cost the Government a single penny piece to withhold the card system for a few days. But the pig-headedness of the Cabinet and the Railway Czar is now costing the State of New South Wales hundreds of thousands of pounds.